biological solution to converting sunlight into energy in a usable form. I suspect we are on the cusp of an exponential growth curve in biology like we experienced with thermodynamics, electromagnetics, and semiconductors over the last two centuries. But if we are at such an inflection point, it just highlights how hopeless it is for government in general and George Bush in particular to pick winners at this point. What combustion technology might the government have locked us into in 1800? What computing technology might we have been locked into in 1950? 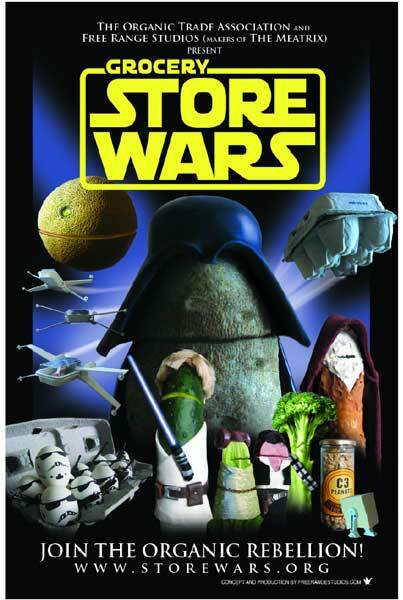 The Organic Foods Trade Association has this terrific spoof on Star Wars, aimed at warning consumers about the "dark side of the farm", which for them of course are non-organic foods. Meet Obi Wan Cannoli and Chew-broccoli. I am kindof neutral on the whole organic foods thing - while happy about the range of new choices available to consumers, organic proponents tend to have statist tendencies and seem all too quick to welcome government intervention to aid their cause and regulate away consumer choices they don't agree with. I have never really been terrified by genetic manipulation of foods and I tend to group those who oppose irradiation of foods to reduce diseases as roughly equivalent to Luddites who oppose vaccinations. UPDATE: You can tell that many bloggers are geeks like me, by the number of Star Wars previews I have read. There is a good one here at the Knowlege Problem, and predictably from Will Collier at Vodka Pundit. A Small Victory is hosting the Carnival of the Force, a roundup of Star Wars posts. REVIEW: I say the movie last night, and my review is here. An interesting post from the Knowlege Problem. An interesting fit with my post earlier this week on Progressives are too Conservative to Like Capitalism. The interviewer characterizes Hayek's Road to Serfdom as "a bible for people on the conservative political side". I really must object to this characterization, and I'd like to think that Hayek would too. Indeed, one of his most powerful essays was titled "Why I am Not a Conservative". Good roundup over at the Knowlege Problem on regulation of Voice over IP (VOIP - basically telephone calls over broadband Internet). The Federal Communications Commission declared today that a type of Internet telephony service offered by Vonage Holdings Corp. called DigitalVoice is not subject to traditional state public utility regulation. The Commission also stated that other types of IP-enabled services, such as those offered by cable companies, that have basic characteristics similar to DigitalVoice would also not be subject to traditional state public utility regulation. This may be good news. If it keeps regulation low and lets this new technology continue to innovate and find its way in the market, great. If it is just two bullies snarling over who gets to take my lunch money, then its not-so-good news. I posted yesterday about my issues with the current Libertarian party and some thoughts about a return of classical liberalism. A big part of classical liberalism was the so-called Scottish Enlightenment, discussed today at The Knowlege Problem, with links to many other sources.